Back in 2014, journalist Peter Hartlaub took the stage at Muni Diaries Live to talk about the now-defunct 77X-Candlestick Express, a.k.a., the Muni Booze Cruise. That story is featured in this week’s podcast, and for that reason, we reached out to Peter to see if he had any “episode extras” he could send us. Boy, were we (and now, you!) in for a treat. After the Muni Diary, I ended up going to the last game at Candlestick Park with my dad Phil Hartlaub, sister Toni Kam and aunt Susan Leal. I thought that would be my closure, but I was assigned to cover the last big event at the ‘Stick, Paul McCartney’s concert. I had seats on the field, but snuck up to Upper Box Section 32, and convinced an usher to let me sit in my family seats one more time – even though they were roped off. I listened to “Live and Let Die” and “Hey Jude,” then left. Our Candlestick seats sit in my parents’ backyard. I’ve already retained a lawyer for the legal fight for them that will ensue between me and my sister when my parents are gone. 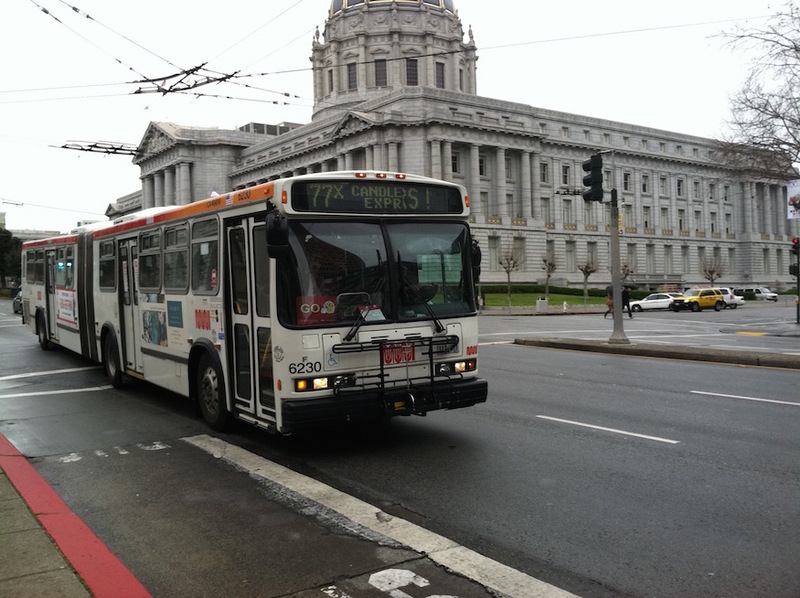 I haven’t traveled on a Muni Van Ness line since. 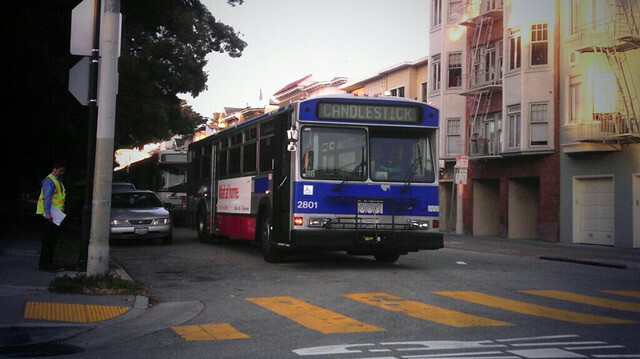 Mutiny on Muni: How was your three-hour commute to Candlestick? You might’ve read about an especially trying trip out to ultimately watch the San Francisco 49ers’ season end. SFGate’s Leah Garchick tells her side of the hellish slog down 101. Here, Muni rider “Mr. Matt” tells his. We were coming in hot. A few mimosas deep, tall boys in hand, and standing patiently at the corner of Van Ness and California, this motley crew was about to embark on the chant-filled, booze-sneaking, 15-minute 77X shuttle ride to Candlestick Park. I can’t claim lifelong fanaticism for the 49ers, but being a San Francisco resident has taught me that you don’t miss a party in this town. The NFC Championship game had all of the potential to turn this city upside down. Flash forward two and a half hours. We’re STILL on the 77X “express shuttle” parked on the 101. The tall cans have been consumed, the chants are falling on bitter ears, and the collective need to urinate is creating a thickness in the air you can cut with a knife. We pray…and look for any receptacle to use as a restroom. The driver is stuck between four lanes of traffic and an increasingly agitated ridership. Passengers start discussing a plan. “Back door!” one yells, but there is nothing he can do. I am assuming the law prohibits Muni from releasing passengers on the freeway. “I can’t take this any more!” another yells and the tide begins to swell. People are standing, swaying and ready to make their move — a mutiny is rising. When the first passenger opens the emergency window there are a few jeers from the crowd. “Ha ha…now put the window down” is what we are all thinking. Then the first lemming jumps. I see her smiling impishly as she crawls through the window, falls onto the hard concrete of the 101 freeway and runs giggling with a drink in her hand down the side of the freeway. Then another jumps ship and another. One after another these angry pirates help each other off the plank through the emergency window and run laughing like small children down a packed highway. They run as far as they can until the need to relieve themselves is too much. For some this is through a hole in a fence into an empty field, but for others it’s on the retaining wall next to the freeway for thousands of 49ers fans to enjoy while driving to the ‘Stick. Cell phone photos are snapped, passersby cheer for these liberated souls. Occupiers might make more news, but this is as organic a protest as I’ve seen. It is, simply put, art. Long story short, for those who sided with the Captain of the 77X, it took more than 3 hours and 15 minutes to get approximately 7 miles. Tailgates were missed out on, frustrations reached their peak…it was a tough day. For those who chose mutiny, the Niners loss didn’t sting as bad. They will have a story to tell of courage, community, and a pleasant Sunday stroll through Hunters Point. Were you aboard the world’s slowest-moving public transportation vehicle yesterday? This is the place to commiserate.